Elemis The Luxury Travel Collection for Her combines seven bestselling skincare products for the face and body. Arrives with a limited edition designer travel bag by British brand Lily and Lionel. An award-winning anti-wrinkle day cream to promote a smoother, younger-looking complexion. Rich yet lightweight, the cream melts effortlessly into skin, comforting, smoothing and hydrating. Infused with a host of anti-aging ingredients, including Mediterranean Algae, Padina Pavonica and Ginkgo Biloba, it has been developed to reduce wrinkle depth and improve firmness, tone and hydration in 14 days. Inspiring a radiant, renewed complexion, it also contains Mimosa which delivers anti-inflammatory and astringent properties, and naturally fragrant Rose to calm and nurture. The ultimate anti-aging cream, it will leave skin looking quenched, firm and youthful. Suitable for all skin types. A deeply purifying formula that gently sweeps away impurities and pollutants to reveal clearer, brighter skin. Infused with Pracaxi Oil and an aromatic blend of Lemon, Orange, Ylang-Ylang and Petitgrain, the cream cleanser forms a luxe lather to lift away dirt and makeup without disturbing the skin's natural moisture balance. Expect a clarified, refreshed complexion with revived radiance and improved texture. A multi-tasking treatment the helps ease stress and restore calmness to your body and soul. Infused with a delicate fragrance that helps melt away stress and tension, the luxurious formula intensely moisturizes dry or mature skin to leave you feeling revitalized and moisturized. Use as a weekly ‘pick me up’ for your hair and enjoy the intoxicating aroma. A gentle, purifying toner that helps to lift away last traces of makeup while toning and rebalancing skin's pH level. Formulated without alcohol or harsh detergents, the toner combines extracts of Lavender with Quillja Wood and Sweet Betty Flower to help soften, decongest and clarify the complexion. Gentle yet effective, this bi-phase makeup remover cleanses the delicate eye and lip area of makeup and impurities, including waterproof mascara. Working to cleanse while refreshing and conditioning, the gentle formula combines White Peony with White Tea and Vitamin B5 to hydrate, soothe and condition lashes. Skin will feel cleansed and revitalized. Ophthalmologist tested. Suitable for sensitive eyes and contact lens wearers. A luxurious formula that combines the hydration of a cream with the protective benefits of an oil. 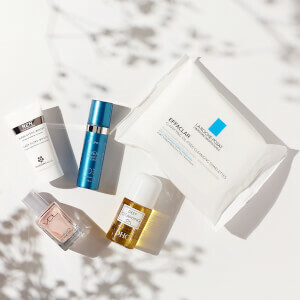 Encouraging skin renewal, the night treatment utilizes Elemis’ Tetra-Peptide, which supports skin’s natural circadian rhythm and therefore enhances repair during sleep. Perilla Seed and Night Scented Stock Oils work in synergy to ensure the complexion is balanced and restored to allow you to wake to a healthy and radiant visage. Expect intense replenishment. Suitable for all skin types. Suitable for all skin types, the daily shower cream forms a luxurious lather that gently lifts dirt and impurities, without stripping moisture. Fortified with a powerful blend of Frangipani, Coprah and Monoi Oils, the cream refreshes and cleanses skin, while invigorating the body and senses for a truly awakening experience. Cream: To be used every morning. Apply a pea size amount into the hands and warm together. Gently smooth over the face, neck and décolleté. Always use upward stroking sweeping motions when applying moisturiser to the face. Face Wash: Massage into dry skin every morning and evening with fingertips. Add warm water to create a luxurious, creamy lather, then rinse off. Body Oil: This product solidifies at cooler temperatures. Place the bottle in a bowl of warm water to return it to a silky liquid. After bathing, apply oil to damp skin, massaging over the entire body. Concentrate on hands and feet for an intensive moisturizing manicure or pedicure. For a weekly treat, massage a small amount into hair. Cover with a warm towel and relax for 15 minutes, shampoo and rinse. Toner: Moisten a cotton wool pad with the toner and wipe gently over the face after cleansing. Can also be used as a revitalizing spritzer. Avoid direct contact with eyes. Should contact occur, rinse thoroughly with water. Makeup Remover: Shake thoroughly to combine. Apply to cotton pad, hold over eyes or lips and gently sweep away make-up. Avoid direct contact with eyes. If contact occurs, rinse with water. Support one hand over the eyebrow, while the other hand removes eye make up. This will prevent dragging the delicate skin. Cream-Oil: Apply every evening, to cleansed skin, avoiding the delicate eye area. If contact with eyes occurs, rinse thoroughly. Shower Cream: In the shower, squeeze a small amount into wet palms, massage over the body and rinse off. For a luxurious bathing experience, smooth over damp skin and immerse yourself in the sensual aroma. Marine Cream: Aqua/Water/Eau, Glycerin, Glyceryl Stearate SE, Simmondsia Chinensis (Jojoba) Seed Oil, Helianthus Annuus (Sunflower) Seed Oil Unsaponifiables, Dicaprylyl Carbonate, Isononyl Isononanoate, Dimethicone, Cetearyl Alcohol, Coco-Caprylate/Caprate, Polyacrylate-13, Phenoxyethanol, Tocopheryl Acetate (Vitamin E), Stearic Acid, Fragrance (Parfum), Lauryl Laurate, Sodium Benzoate, Xanthan Gum, Glyceryl Polyacrylate, Polyisobutene, Theobroma Cacao (Cocoa) Seed Butter, Potassium Sorbate, Triticum Vulgare (Wheat) Germ Oil, Citric Acid, Daucus Carota Sativa (Carrot) Root Extract, Tocopherol, Chlorella Vulgaris Extract, Glyceryl Acrylate/Acrylic Acid Copolymer, Padina Pavonica Thallus Extract, Disodium EDTA, Polysorbate 20, Sorbitan Isostearate, Ginkgo Biloba Leaf Extract, Hydroxyisohexyl 3-Cyclohexene Carboxaldehyde, Rosa Centifolia (Rose) Flower Extract, Acacia Decurrens Flower Extract, Porphyridium Cruentum Extract, Butylphenyl Methylpropional, Linalool, Citronellol, Cedrus Atlantica Bark Oil, Cuminum Cyminum Seed Oil, Citrus Limon (Lemon) Peel Oil, Limonene, Geraniol, Hydroxycitronellal. Active Ingredients: Padina Pavonica, Dermochlorella, Ginkgo Biloba, Porphyridium Cruentum, Absolutes of Rose and Mimosa. Face Wash: Aqua/Water/Eau, Cetearyl Alcohol, Ammonium Lauryl Sulfate, Hectorite, Sodium Stearoyl Glutamate, Disodium Cocoamphodiacetate, Propylene Glycol, Phenoxyethanol, Hexylene Glycol, Lactic Acid, Sodium Chloride, Xanthan Gum, Sodium Cocoyl Apple Amino Acids, Chlorphenesin, Disodium EDTA, Benzoic Acid, Citrus Aurantium Dulcis (Orange) Peel Wax, Pentaclethra Macroloba (Pracaxi) Seed Oil, Fragrance (Parfum), Glycerin, Sodium Dehydroacetate, Benzyl Benzoate, Citrus Limon (Lemon) Peel Extract, Tetrasodium EDTA, Ficus Carica (Fig) Fruit Extract, Cananga Odorata Flower Oil, Citrus Aurantium Dulcis (Orange) Peel Oil, Citrus Limon (Lemon) Peel Oil, Myristica Fragrans (Nutmeg) Kernel Oil, Sodium Benzoate, Potassium Sorbate, Citrus Aurantium Amara (Bitter Orange) Leaf/Twig Oil, Citrus Aurantium Amara (Bitter Orange) Peel Oil, Coriandrum Sativum (Coriander) Fruit Oil. Body Oil: Cocos Nucifera (Coconut) Oil, Gardenia Tahitensis (Tiare) Flower Extract, Plumeria Rubra (Frangipani) Flower Extract, Fragrance (Parfum), Tocopherol, Amyl Cinnamal, Linalool, Benzyl Salicylate, Hydroxycitronellal, Butylphenyl Methylpropional, Benzyl Benzoate. Active Ingredients: Frangipani, Coconut Oil. Toner: Aqua/Water/Eau, Polysorbate 20, Glycerin, Methyl Gluceth-20, Phenoxyethanol, Disodium EDTA, Chlorphenesin, Lavandula Angustifolia (Lavender) Oil, Linalool, Sodium Dehydroacetate, Saponins, Tromethamine, Geraniol, Limonene, Lavandula Angustifolia (Lavender) Flower Extract, Saponaria Officinalis (Sweet Betty) Leaf/Root Extract. Makeup Remover: Aqua/Water/Eau, Cyclopentasiloxane, Isohexadecane, Isopropyl Palmitate, Hexylene Glycol, Maris Aqua (Spring Sea Water), Sodium Chloride, Glycerin, Sodium Benzoate, Diazolidinyl Urea, Disodium EDTA, Panthenol (Vitamin B5), Potassium Sorbate, Rhizobian Gum, Phenoxyethanol, Sodium Hyaluronate, Camellia Sinensis (White Tea) Leaf Extract, Paeonia Lactiflora (White Peony) Root Extract, Nymphaea Alba (White Lily) Root Extract, Chlorphenesin, Sorbic Acid, Sodium Hydroxide. Active Ingredients: White Water Lily, White Peony Extract, White Tea, Marine Spring Water, Vitamin B5. Shower Cream: Aqua/Water/Eau, Glycerin, Coco-Betaine, Sesamum Indicum (Sesame) Seed Oil, Ammonium Lauryl Sulfate, Fragrance (Parfum), Phenoxyethanol, Xanthan Gum, Cocos Nucifera (Coconut/Coprah) Oil, Carbomer, Polyquaternium-10, Sodium Hydroxide, Disodium EDTA, Linalool, Ethylhexylglycerin, Caprylyl Glycol, Plumeria Alba (Frangipani) Flower Extract, 1,2-Hexanediol, Plumeria Rubra (Frangipani) Flower Extract, Amyl Cinnamal, Hydroxycitronellal, Benzoic Acid, Gardenia Tahitensis (Tiare) Flower Extract, Caramel, Tocopherol. Active Ingredients: Tahitian Monoi, Coconut Oil, Frangipani Flowers.